Need new nibbles to serve to the crowd? Something a little meltier and meatier than crackers and cheese? 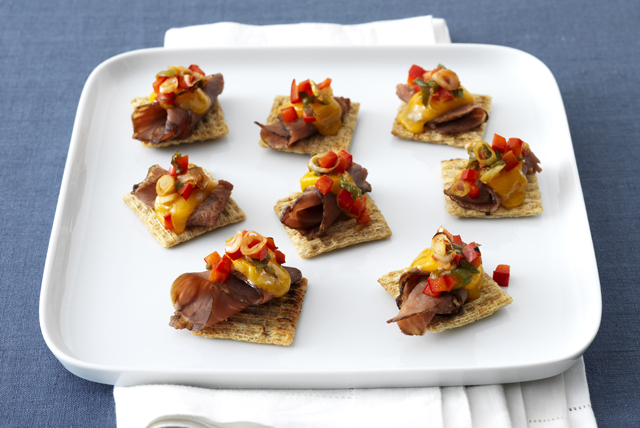 Put our roast beef bites on the party menu. Cook vegetables in nonstick skillet on medium heat 1 min. Stir in steak sauce; cook 1 min. Set aside. Cut cheese slices in half. Top crackers with meat, cheese and vegetable mixture. Place 8 topped crackers on microwaveable plate. Microwave on HIGH 20 to 25 sec. or until cheese begins to melt. Repeat with remaining crackers. Substitute your favorite flavor of KRAFT Barbecue Sauce for the steak sauce.